This chic outfit printed with traditional dragon and floral patterns, is too spectacular to let go! The top has a mandarin collar fashionably cut neckline. 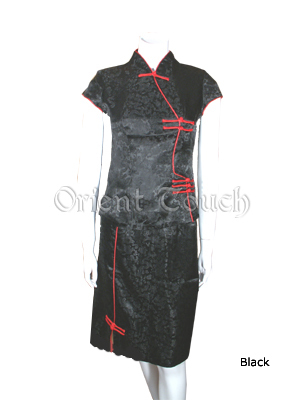 Features irregular cut with red trims, it integrates traditional Chinese elegance with a modern western styling. The form-fitting skirt in knee-length is designed with a low slit adored with frogs. A cozy way to attract many comments from admirers.